No one knows your business better than you. Don't be limited to a single logo concept from an overpriced design form. Get easy recognition of your name, image, symbol, icon or trademark using the flexible design tools of Logo Design Studio Pro to quickly produce thousands of unique results. Simply adjust the colors, fonts, shapes and effects in each logo template to match your own unique look. Looking to start your own design business? Use Logo Design Studio Pro to create new logos you can sell to others. The creative options available in Logo Design Studio Pro are perfect for designing what you need for websites, business cards, letterhead, t-shirts, banners, sports teams, events, and parties. Logo Design Studio Pro features include: 1) Straightforward workspace lets you design your logo in minutes; 2) Over 5,000 logo design graphic objects and conceptual artwork; 3) Over 1,500 industry based, pre-designed logo templates; 4) Over 250 creative textures to add to your logo; 5) Slogan and tagline resource library; 6) Accurately match any website background using the Color Picker on your logo canvas; 7) Shape drawing tool to create unique logo designs that best represent your business look; 8) Special effects such as Shadows, Blurs, Embossing & Frames; 9) Helpful trademark and copyright guidelines to secure your identity; 10) Easily send your project file in a format any professional print ship will accept. Logo Design Studio Pro offers the greatest range of designer tools to help you quickly and easily create a business identity from your own library of uniquely branded logos and graphic images. 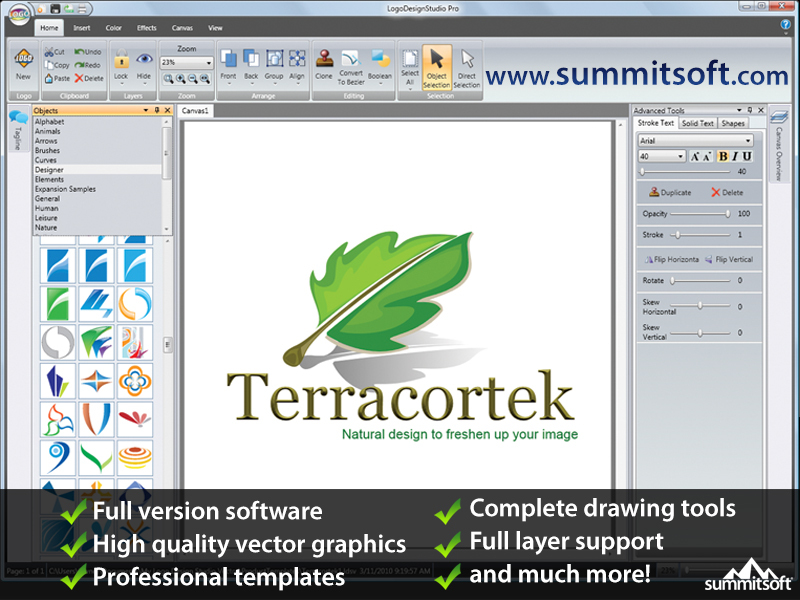 By modifying or importing images, shapes, graphic objects and text, each professionally designed logo included in the software is able to produce thousands of unique results - all in a matter of minutes! If your identity evolves or completely changes at any time, simply recreate a new company logo design at no additional cost. Logo Design Studio Pro Version 1.7.3 contains bug fixes. Font crashing issue has been resolved with this version.